Have you stumbled onto suspicious financial transactions and aren't sure what to do next? We encourage you to take advantage of the forensic accounting services offered by Archer Tax and Accounting Service. 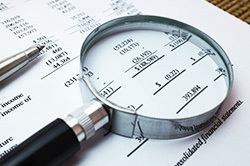 As experienced Tinley Park, IL forensic accountants we know how to analyze a company's financial records and expose questionable practices and inconsistencies. We can also review personal finances for divorce proceedings to locate unreported income and assets that one party may be trying to hide. To learn more about our forensic accounting services call 708-633-9854 today for a free initial consultation. We are a highly trained and qualified Certified Fraud Examiner (CFE).